Norton WiFi Privacy is a VPN that especially protects users whenever they access Wi-Fi hotspots. The application secures users’ passwords, financial information, and personal accounts and passwords whenever they connect to a public Wi-Fi or unsecured network. Moreover, Norton WiFi Privacy provides optimum security together with the Norton Security program. This is optional—but affords users all-around security and protection against viruses and other malicious entities. Plus, users can look forward to enjoying highly-encrypted connections, anonymous browsing, and faster access to their favorite content. With Norton WiFi Privacy, users can look forward to a stress-free internet browsing wherever they are, especially when they are on public or unsecured connections. The application applies the same encryption technologies as the most stringent banks on all private data so users can rest assured they are not accessed illegally or maliciously. 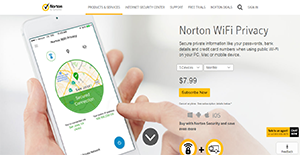 Norton WiFi Privacy aims to protect and secure users’ online activities all around. That is why the program itself does not collect information regarding websites visited or apps used. A total no-log rule is applied so activities, as well as locations, remain unknown. Norton WiFi Privacy also affords fast speeds when it comes to internet connections so users can access their favorite content with ease. On top of that, the software lets users change their locations at will so they can do away with content-locking rules implemented by various websites. This way, they can enjoy truly unimpeded access to their most-used websites and apps. Online ads have a way of making internet browsing slower. That is why Norton WiFi Privacy is equipped with supreme ad blocking technologies so users can enjoy their work or leisure time on the internet without annoying ads. If you are considering Norton WiFi Privacy it might also be a good idea to analyze other subcategories of Best VPN Services gathered in our database of SaaS software reviews. Each enterprise has different wants and requires a software that can be personalized for their size, kind of workers and clients, and the particular industry they are in. For these reasons, no platform can offer perfect tools off-the-shelf. When you search a software product, first be sure what you require it for. Read some Norton WiFi Privacy reviews and ask yourself do you want basic features or do you want sophisticated tools? Are there any industry-specific tools that you are seeking? Obtain the answers to these queries to help your search. There are multiple elements that you need to consider and these include your finances, specific business wants, your company size, integration requirements etc. Take your time, check out a few free trials, and finally select the app that offers all that you require to enhance your organization effectiveness and productivity. How Much Does Norton WiFi Privacy Cost? We realize that when you make a decision to buy VPN Services it’s important not only to see how experts evaluate it in their reviews, but also to find out if the real people and companies that buy it are actually satisfied with the product. That’s why we’ve created our behavior-based Customer Satisfaction Algorithm™ that gathers customer reviews, comments and Norton WiFi Privacy reviews across a wide range of social media sites. The data is then presented in an easy to digest form showing how many people had positive and negative experience with Norton WiFi Privacy. With that information at hand you should be equipped to make an informed buying decision that you won’t regret. What are Norton WiFi Privacy pricing details? What integrations are available for Norton WiFi Privacy? Pros: Although it only has 25 server locations, they are strategically spread out across the globe: Europe, Africa, North America, South America, the Middle East and the South Pacific. The diverse locations makes switching servers smoother anywhere you are. Likewise, its system is compatible with most popular protocols, including PPTP, SSTP, L2TP, IPsec and OpenVPN. Cons: Extra features can slow down speed at times. Pros: Tech aside, the name Symantec and Norton put to rest all worries if this product is reliable. The anti-virus firm helps you achieve anonymity in public connections like public WiFi. It encrypts your sensitive data like credit card information and login credentials in transit. You can be sure the encrypted tunnel is solidly backed by the company’s decades of experience against cyber threats. Cons: It has an enabled WPA that slows down performance. You need to disable it. If you need more information about Norton WiFi Privacy or you simply have a question let us know what you need and we’ll forward your request directly to the vendor.